The Guillermo Tell 2012 renovation enhances the hotel’s identity creating a familiar atmosphere through an elegant and iconic style, seeking to optimize communication with the guest. 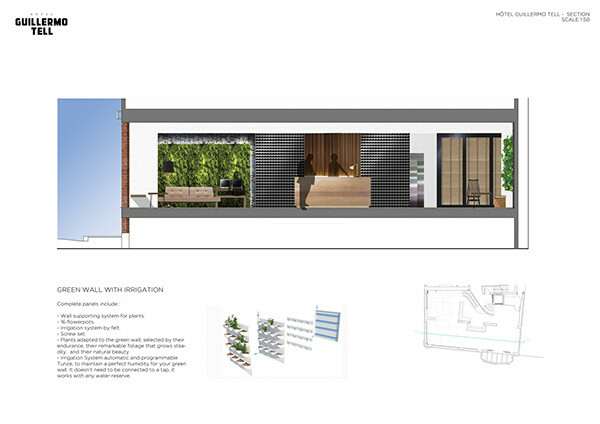 The Reform stands at 2 cores, the hall and the rooftop, where it creates relaxed spaces to disconnect from the stress f the city and reconnect with nature. 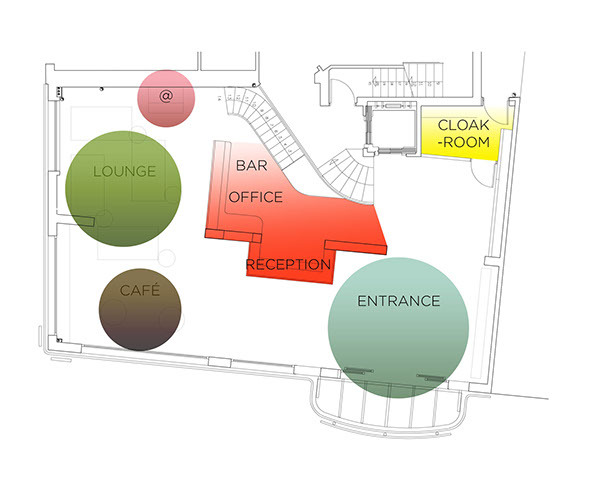 The hall becomes a free plant where the reception distributes the space acting as axis of different areas of the hall. At the core of the space, the office, with improved its intimacy and ergonomics blends with the reception, framed by two black tiled columns that attract the guests when they first come in. The reform has divided the long-term archive storage from the files neded durin everyday use, optimizing office work. The room where the office was previously located remains now free for guest luggage storing, which the hotel lacked in its previous state. 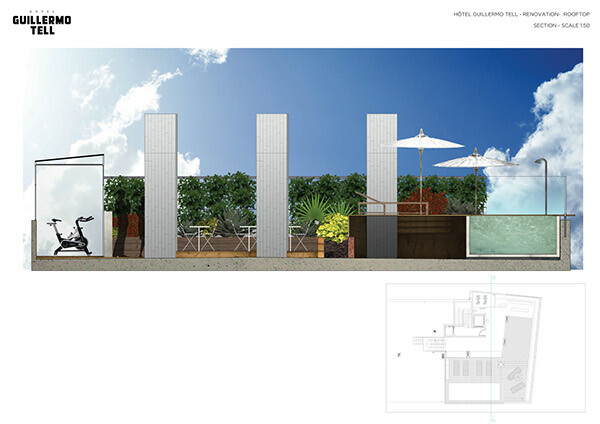 The gardening is the main element of the rooftop; an oasis with select views of the city where the guests may disconect from concrete and traffic. 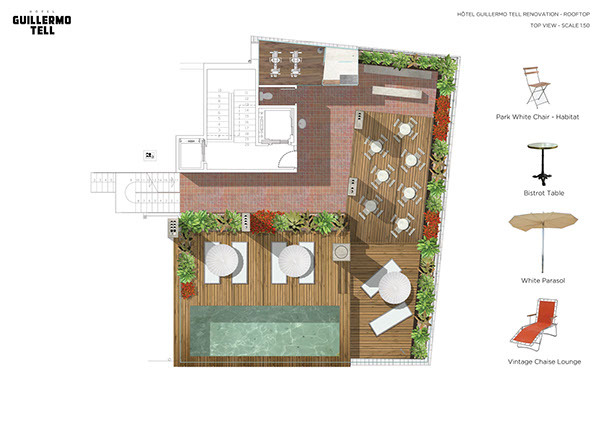 The wooden flooring divides the three main areas of this terrace: the bar, the sunlounging area and the pool. the bar is built in white cement following a linear and minimalistic style. The space may be transformed for the night, storing the sunlounges under the pool and replacing them with cocktail chairs and tables. 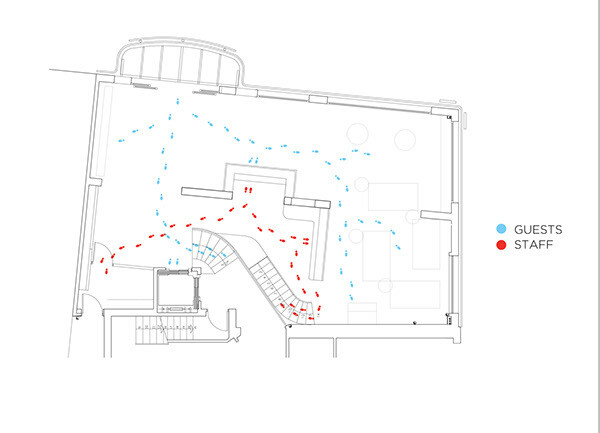 The elongation of the flues adapts to the appropriate height above the ground. The new flooring is made of white matte tiles following a fresh and clean atmosphere. The gym is an ephemeral structure of traslucent glass, properly ventilated with the necessary equipment for a complete workout, including a shower and locker room. 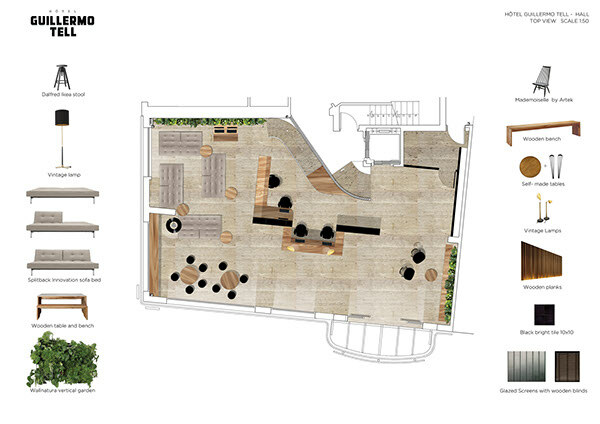 Complete renovation of hotel in Barcelona, including the rooftop and it´s identity design.